The smaller railway companies which operated in South Wales in the first two decades of the 19th Century found that the best type of locomotive for hauling the long trains of coal from pit-head to the docks was the 0-6-2T. When the Great Western Railway was expanded in 1921 to include these smaller companies there was a need to introduce a more modern version of the traditional valleys tank engine. The Chief Mechanical Engineer of the Great Western Railway, C. B. Collett introduced the 56XX Class in 1924 & over the next 5 years 200 locomotives of the class were built. Most were built at Swindon, but in 1928, Swindon works was busy & a batch of locomotives were built at the works of Armstrong Whitworth in Newcastle-Upon-Tyne. No.6686 was one of this batch, being completed in September 1928. It spent all its life in South Wales, mainly based in Duffryn Yard Locomotive Shed at Port Talbot & worked on freight & branch passenger trains in that area. It was withdrawn from service in April 1964. Most of the locomotives used to transport coal in South Wales in the early 1920's were of the 0-6-2 tank design as the Rhymney, Taff & Barry Railways had used this configuration for some years. 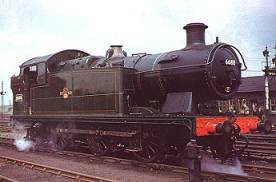 After grouping in 1922 & new engines were required by the GWR, it was decided that this was arrangement was best suited for the work & the working conditions, & so Charles Collett designed the '5600' class. The first engine built was number 5600 - no prototype was needed - & was constructed using many standard Great Western parts such as Standard number 2 boiler, 4 feet 7½ inch driving wheels & the 3 feet 8 inch trailing wheel. One striking detail of the class was the smokebox overhang which ended at the buffer beam. Production continued with minor detail alterations, for example parallel buffers replaced the tapered type & balance weights fitted inside the driving wheels webs opposite the crank pin. The last batch of the class was built by Armstrong Whitworth between August & October 1928. One feature of this class is that they ran better in reverse than in forward gear, making the trailing wheel into a bogie wheel. Some engines built by Armstrong Whitworth were modified by Swindon for noisy brakes. From 1934, the class were fitted with recesses in the rear of the bunker, & later on, sliding screens were fitted to the cab sides. The first withdrawals of the class were four locomotives in May 1962, while the last engine in service was 6668 which survived until the last month of GWR steam, December 1965. Due to these engines working in Wales, eight of the nine preserved examples were taken to Dai Woodham's yard at Barry after withdrawal. The nine preserved engines are numbers 5619, 5637, 5643, 5668, 6619, 6634, 6686, 6695 & 6697. Running numbers: 5600 - 5699, 6600 - 6699. Built: 1924-7 (5600 - 5699, built by GWR), 1927-8 (6600 - 6649, built by GWR), 1928 (6650 - 6699, built by Armstrong Whitworth).